Any given workout regime can become boring and repetitive quickly! One way to keep your exercise routine fresh is by making use of a plyometric box. There are countless exercises that can be done using this piece of equipment that target your whole body and have many benefits. In this article, I will be introducing you to 8 of my favorite plyo jump box exercises. I’ll also be including an example workout, so you can get a head start! Plyometric training is all about explosive compound movements that are usually done with light weights or just your bodyweight. A plyometric box is a piece of equipment used to perform a range of plyometric exercises. 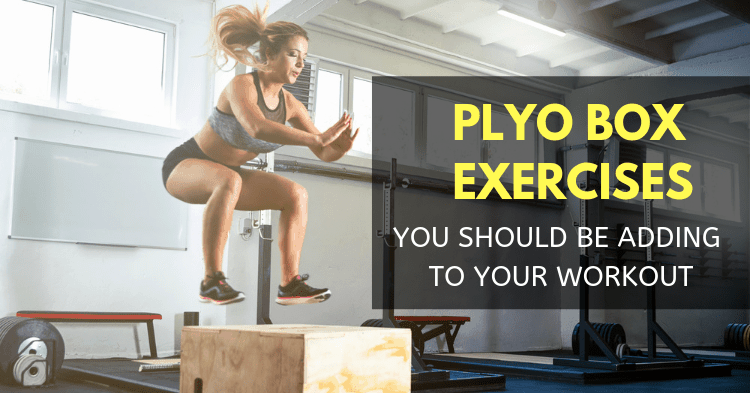 Sure, you can use a bench instead, but the plyometric boxes are designed with specific plyo exercises in mind and come in a range of heights and sizes to suit. The aim of the game with plyometrics is to generate maximum force over minimum time. High intensity, if you like! Each movement should be powerful and explosive… which most time means leaving the ground. Eeeek! Below you will find out about 8 exercises that include your upper and lower body that can be done using a plyo box. What better exercise to start with than a plyo box classic, the box jump! 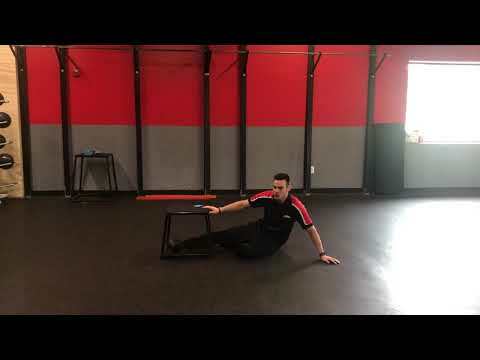 This exercise is great for building coordination and explosive power through the legs. 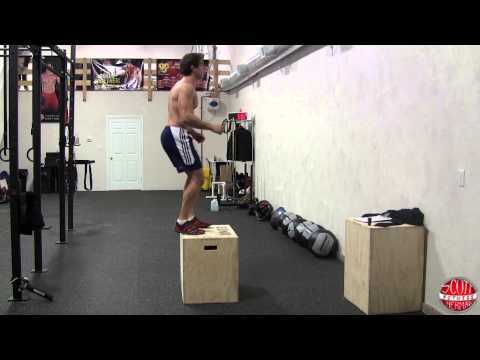 If you have never done this exercise before, start with a smaller jump box. To perform the box jump, start by standing in front of the box with your feet shoulder width apart and toes pointing forwards. You can use your arms to help power the jump by swinging them, but you should mostly focus on creating power through the legs and extending through the hips. Lift your knees to your chest as you jump on top of the box. There are a few key points to take note of when doing this exercise. Your spine should always be neutral, not rounded. Make sure that when you lift off the ground and when you land on the box that your knees are not collapsing inwards. And you should focus on landing on your whole foot, rather than your toes or your heels. By incorporating a plyo box into this exercise, a decline position is created. And so, the decline mountain climber is born! To do the mountain climber using a plyo jump box, start with your hands shoulder width apart on the ground and your feet on the box. Your body should be in a strong, straight line with your core engaged. From here, alternating from left to right side, drive your knee towards your elbow. This exercise can be done fast or slow depending on your goals. I, personally, prefer the slow and controlled version for maximum time under resistance. This is an exercise that can be done with or without added weight, for example, weight plates or dumbbells. The lateral plyo box step up differs from a standard frontward facing step up in that it is more effective at targeting the glutes. Start standing side on to the plyo box with your foot on the box, and a bend in your knee. From here, push up through that leg until you are in standing position (without resting your other foot on the box). Squeeze your glute at the top of the movement before stepping back into starting position. Make sure your knee stays behind the toes of the foot that is on the plyo box as to avoid excessive strain. Keep your core engaged to assist you with balance. Do all reps on one side before switching sides. The difficulty of this exercise will depend on the height of the plyo box you use. The lower the box is, the harder it will be. Place your hands on the box on extended arms and have your body in a straight line from your shoulders to your toes. Lower your body down towards the box into the bottom of a push up, then explosively push back up so your hands leave the box. The “getting air” part can be left out for a simpler version of this exercise, if you feel it is beyond your abilities. However, the elevation of the plyo box does give you a slight strength advantage over the standard push up position. This is one of my personal favorites. The single leg box squat is a great functional exercise for building unilateral glute strength. It is also the ultimate progression exercise for doing a pistol squat, unassisted. Stand in front of the box with your feet hip width apart. Lift one foot off the floor then proceed to go into a one-legged squat, ending by sitting on the box. You should fully sit on the box as to allow your glutes to turn off, and then to fire up from the bottom position to stand back up. Push back up from the box, squeezing the glute of your working leg hard at the top of the movement. Perform all reps on one leg (preferably starting with your weaker side) before changing sides. Ensure that your knee stays behind the toes of your working leg whilst going into each squat. Keep your core on and your spine neutral! Pro tip: keep your weight centered in your heels to allow for more glute action! A variation of the standard side plank – the plyo box side plank allows for more progression! Start resting on your elbow with one foot on the box and one foot under the box on the floor. From here push your hips up until your body is in a straight line. You should feel this working your core and the inner thigh of the top leg, as well as your stabilizing shoulder. The easiest version of this exercise would see you leave your bottom leg on the floor. If you want an extra challenge, lift your bottom leg to the underside of the top of the box, so your legs are together! Be careful not to let your hips dip too low or lift too high during whilst doing this side plank. A challenging one for sure! This exercise will test your stamina and endurance as well as your lower body strength and power. I wouldn’t recommend this exercise for beginners. To perform this exercise correctly, place one foot on the plyo box and have your other foot on the floor, in a wide step stance. From here, lower down into a lunge and then explosively push back up so your front leg leaves the ground. Land softly through the bending your knee back into a lunge, as to avoid too much impact. These lunges are fast paced and powerful. Complete all your reps on one side before starting on the other side. If you experience knee pain whilst doing this exercise, a combination of VMO strengthening and ITB band release should assist you in being able to do this pain-free. Of course, this exercise can also be done on a bench. However, the fact that plyo boxes come in a range of heights/sizes makes it easier to facilitate. Start with your feet on the box and your hands on the floor, shoulder width apart. From here, you should push your hips up so your arms are in a straight line to the floor (pike position). You can then start lowering your torso down and pushing back up through bending your elbows. If you’re new to this exercise you may want to start with your knees on the box. You can then progress to straightening your legs and having your feet on the box. The more vertical your body is in your pike position, the more you will target your shoulders (as opposed to your chest). I’ve put together a workout that contains a few of the exercises I have covered in this article for you to try out. This workout is designed to work your body from head to toe and really get your heart rate pumping! This workout consists of 1 x circuit. Rest for 2 mins and repeat x 3! Don’t forget to check out the video links provided in the exercise descriptions, above. They will show you the right technique to ensure you get the best out of this workout! 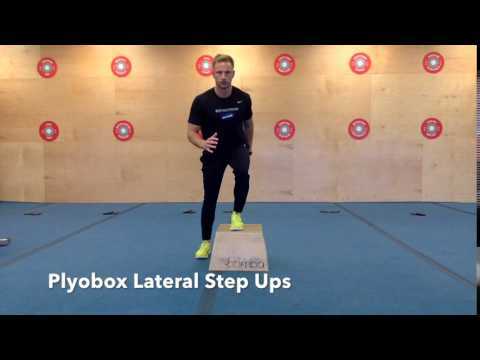 I hope you enjoyed learning about these exercises that can be done using a plyometric jump box. As you can see, there is a wide range of exciting exercises that target your whole body that can be performed with the use of this piece of equipment. If you’re looking to develop serious strength and power, then plyo box exercises are for you! They are also an excellent way to hike up your heart rate and get you burning mega calories, which tie in with weight loss goals. What is your favorite plyo box exercise? Let us know in the comments section below!